Great News – 24 Hour 7 Days a weeks Shopping…..Great Offers …… Great Times…. I am running around gathering fruit up at the moment. Some of you may remember that we moved house just on Christmas last year. We inherited a lovely garden with lots of fabulous plants and some fruit trees in it: two apple trees, a plum tree and some black-currants. Well the birds have eaten most of the black-currants before we got a chance to pick them so I suspect there will be some netting going up next year! But the plums and the apples!!!! Wow!!! there are so many!!! I picked the first lot of plums last week and we had plum crumble for tea, but there were so many, I took some to both my neighbours, made another crumble and then two pots of plum jam! Now it has been a few years since I last made jam….we wont speculate how many suffice to say it is definitely more than thirty!!! still, I thought, it would be a dreadful shame for all this fruit to go to waste, so I made 10 pots of apple jam/sauce too!!! and this weekend? We are making apple chutney. It is very exciting, we bought this huge big jam pan, thermometer and jar grabber thingummy – for get the sterile jars out of the hot water! This years Christmas gifts will mostly contain chutney and cheese – so sorry to spoil the surprise if you are normally on my present list!!! Great News!!!!! Let the shopping commence!!! 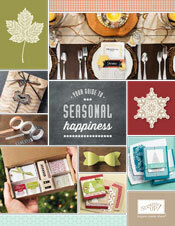 I am delighted to tell you that Stampin’ Up! have got our online shops back up and running!!! Yippee!!! What does this mean to you? Well, essentially it means you can order your favourite Stampin’ Up! products 24 hours a day!!!! …And I will still be your personal Demonstrator – any questions you can still fire them to me by email or just head right on over to my Stampin’ Up online shop and pick your order, any time, day or night! You can click here to head right on over ….. or use the button on the side to take you straight there too…. All orders – no matter how much you order, can be delivered right to your door for the flat shipping rate of £4.95! What is more exciting is that you can still be part of the Party! I have set up an online open Party – all you need to do is enter the Hostess Code UMXM4YKU when you place your order and one lucky person will be our Online Hostess and be up for the chance to earn £25 Hostess Money to spend on any Stampin’ Up! product!!!! All orders using the Hostess code will be entered! The First Online Hostess will be announced the very next day!!! You can still place a single qualifying order for £150 or more and guarantee your Free £25 Stampin’ Up! Hostess Spend – no need to wait until the 22nd. When you click here you can also view any Stampin’ Up! offers and promotions….like this one…. 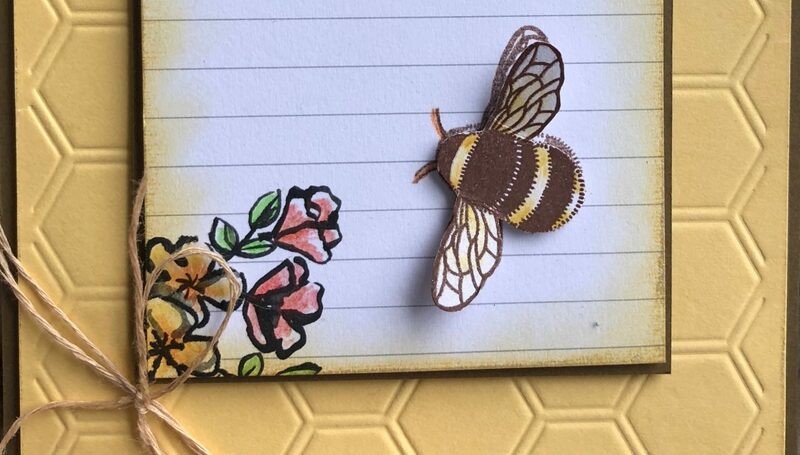 You can save 15% off when you buy the Butterfly Stamp and Punch together as a bundle! Phew! As if that is not enough….. I am delighted to mention that the ALL NEW Autumn/Winter Catalogue is now available – you can either email me on stampdelicious@gmail.com or head over to the online shop here …. where you will be able download and view it any time…. So Much to Share with you…. 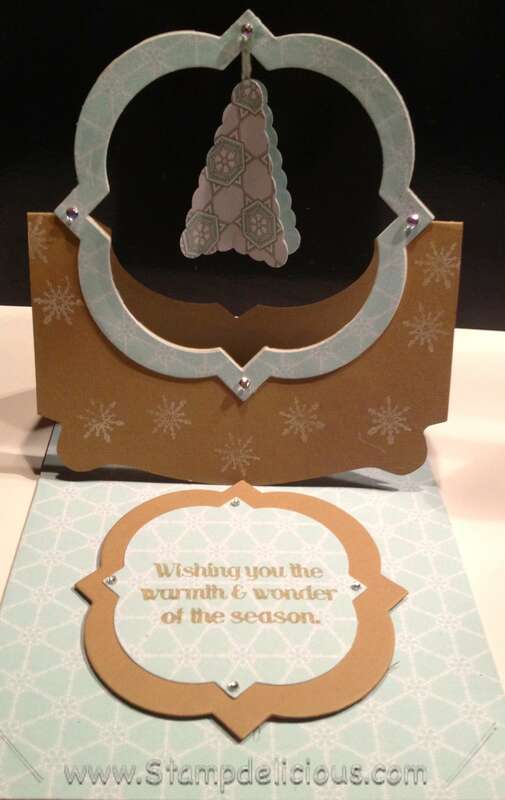 This first project samples the beautiful Winter Frost Designer Series Paper which features 2 Foil accented papers to compliment the 5 doubles sided papers – 12 sheets in the pack. 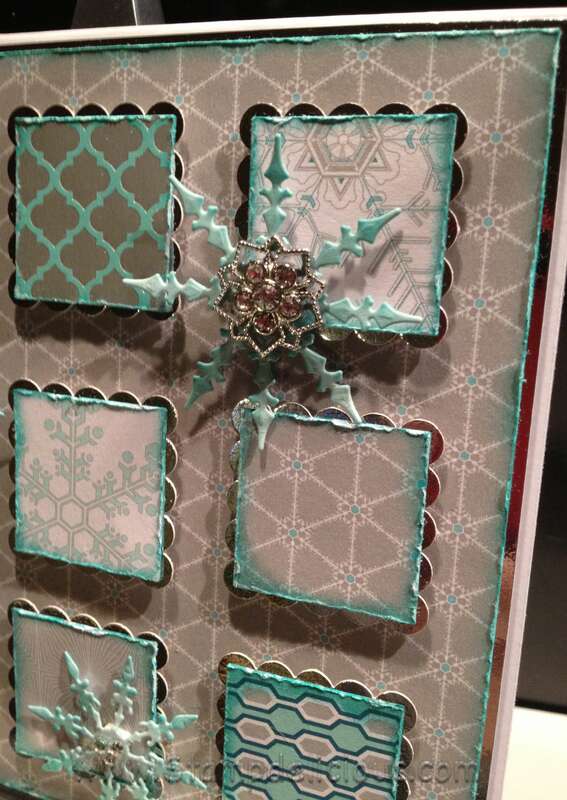 Also featured is the foil sheets and here I used the Postage Stamp Punch to create a backdrop for my paper samples to sit on. In this picture you get a closer look at the fabulous and glamourous Frosted Finishes Embellishments – these can be found in the new autumn Winter Catalogue. 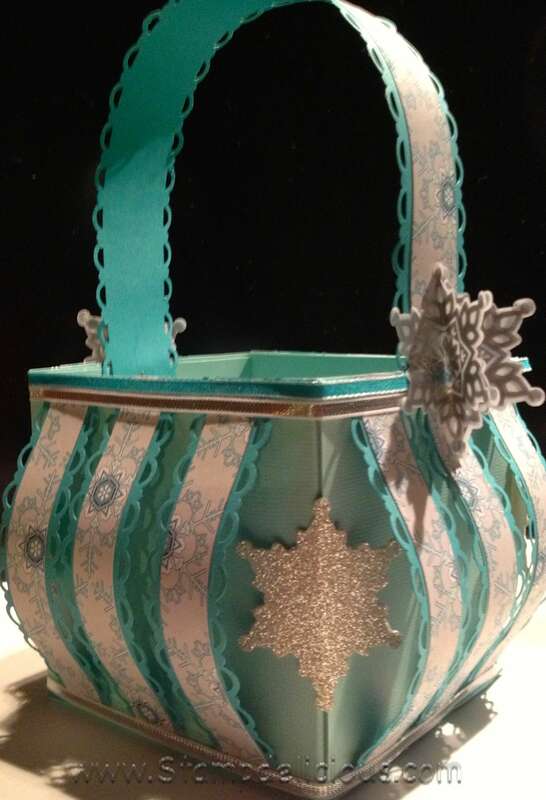 Next Up, and still using the Winter Frost Papers we are making this super basket – I found this on Pinterest and the original is made by this lady here A Big Thank goes to Wenche for an amazing design …very Frosty colours here – Can you tell I adore this paper? Just one picture for this as a bit of a sneak peak but you are getting lots of ‘things to do’ with this item and this project uses the new colours Bermuda bay and Coastal Cabana as well as Coastal Cabana silver Ribbon (also in the new catty!!). And lastly…..this next item I have CASE’d from here, a big Thank You to Tammy Tobac for a fabulous design, I adored this lovely design as soon as I saw and thought I would try and make it in the new papers and colours – I am also going to do it in the Red and Greens as I just think it is lovely! 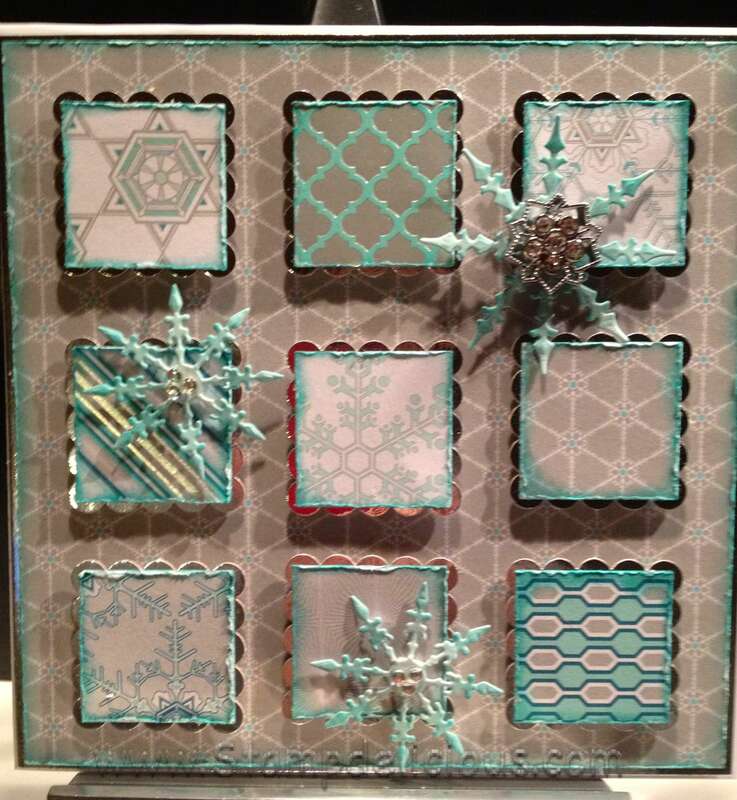 This one uses the Bubbling Brown Sugar card-stock, Winter Frost DSP, The Petite Pennants Builder punch, The Warmth and Wonder Stamp set which is a Hostess set (see above where you could be the NEWEST Stampin Up Hostess, right from the comfort of your armchair!!!)) And the Window Frames Collection frame-lits – I totally love the frame-lits – didn’t think I would but I use them all the time now, they are versatile and can cover a multitude of sins!!!! I am so pleased with this months projects – I really enjoyed making them and photographing them. 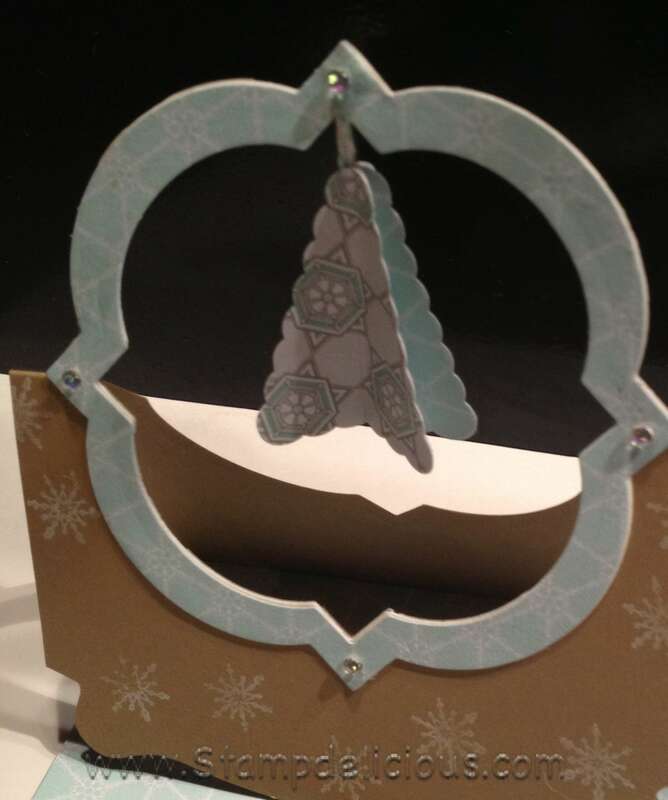 I suspect the flying Christmas trees card will end up being one of my main card makes for this Christmas in both colour ways so once it is made in the Red and Greens I will share it with you…. Creative Lull….A Share….and EXCITEMENT about what’s coming….